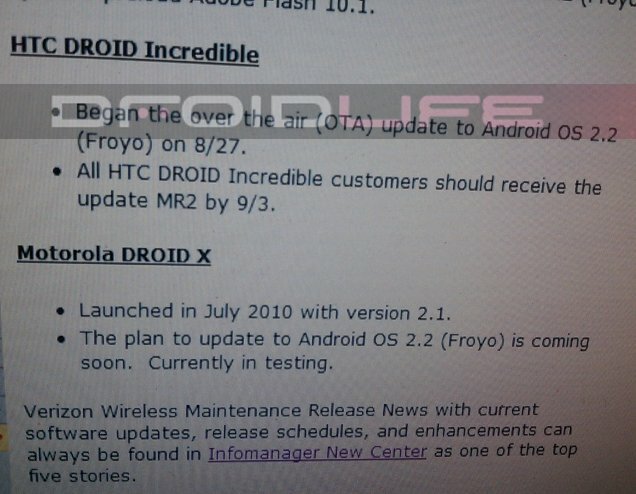 Forget what the rumors said over the weekend, the Droid Incredible Froyo update has not been put on hold and is still rolling out to devices right now. The proof would be the dozens of emails we’ve received this morning from people who received notification to update or found the update.zip which allows for immediate 2.2 awesomeness. Verizon is currently planning on having it on all DI’s by 9/3 (Friday) which seems a little ambitious, so don’t hold your breath on that date. I wouldn’t be surprised if they have to extend that out just a little and rightfully so. Anything to avoid a Droid 2.1 fiasco, right? As for the Droid X, the “official” 2.2 update is still going through last minute tests and does not have a specific date for launch. The Motorola forums mentioned “early September” just yesterday, so we can only hope that means within the next 2 weeks. Test that baby already! We need some official Froyo-ness! Yahoo Fantasy Football App Hits Market!